If you've already run a 5K, congratulations on your progress so far. A 5K is no small feat for a novice runner and it can serve as a stepping stone to longer races. One of the next logical distances is the 10K. Although you may be able to manage with less, the consensus in the running world is that you should take at least eight weeks to move on to a 10K race. 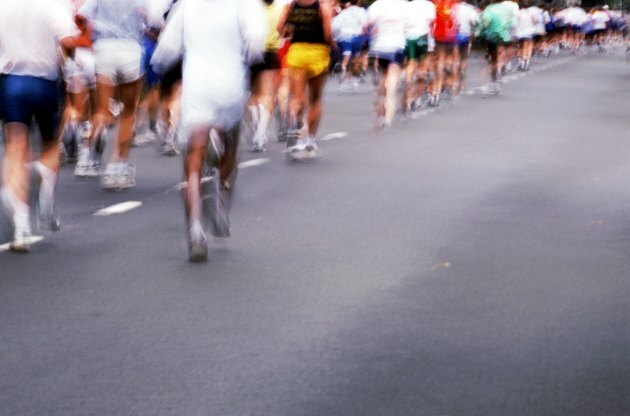 If you can run a 5K you can likely manage a 10K without any additional training. This may come as a surprise to you -- after all it's twice the distance. But the basic fitness that you gain by training for a 5K is enough to see you through a 10K race. As running icon Hal Higdon explains, "you might be sore the week after a 10-K race, but you still could finish" if you've trained for a 5K. Running a 10K without proper training isn't ideal. And as Higdon says, "if you've made the decision to run a 10K race you might as well do it right." To do it right, Higdon recommends using an eight-week training program. Higdon's plan calls for three runs per week, with one long run per week. The long runs start at 3 miles -- about 5 kilometers, and the plan culminates with a 10K run at the end of week eight. In running there is a general rule of thumb that you can safely increase your running distance by 10 percent per week. Using this approach you can simply increase your training runs by 10 percent every week. If your longest run was a 5K then your longest run will be just over 10K in eight weeks time. This gives you the same timeline recommended by Higdon, but allows you to continue with the program you've been using. Cool Running offers a slightly longer 10K training plan which takes 12 weeks to complete. Before starting on this program you should already be able to run four miles, three times a week and 3 miles once a week. If you can't manage this already you'll need a few weeks to build up to it. The plan actually calls for you to do your first 10K race at the end of week eight as a trial run, but gives you another four weeks to build up to your serious attempt. How to Run Your Best 5k Ever!